Published Mar 8, 2019 by Addison-Wesley Professional. Part of the LiveLessons series. Put learning into practice with Tableau LiveLessons for the aspiring visual data storyteller. There is a data revolution happening across the globe. From academics to politics and everywhere in between, the world’s stories are being told through their data points. Although telling stories about data isn’t new, we are now telling them in ways that are more meaningful and impactful than ever before as an emerging new class of visualizations attempts to tell the world’s stories through the power of data visualization. However, visual data storytelling is not an inherent skill, and data stories differ from traditional storytelling in many ways. Further, while robust visualization tools support rich and diverse forms of visual data storytelling capabilities, crafting a compelling data narrative is not a process that we can rely on a tool to do for us. These lessons provide a hands-on foundation for users to learn how to craft visual data narratives using the most appropriate visualizations, apply visual design to engage their audience, and purposefully structure a narrative framework to deliver a compelling, actionable data story that invites discovery, solicits new questions, or offers alternative explanations—all using one of the most powerful and ubiquitous visualization tools on the market today, Tableau. 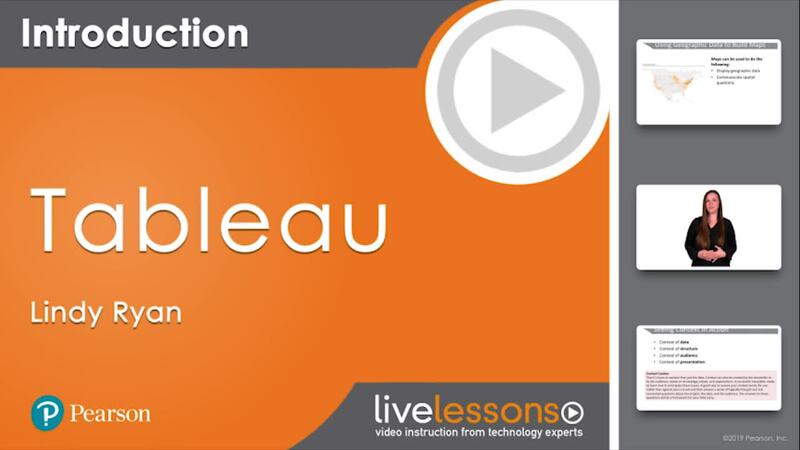 This chapter sets the context for the lessons covered in the entire catalog of the Tableau LiveLessons. You’ll learn the basics definitions of both data visualization and visual data storytelling, as well as how the two practices are similar and different, and how both have been transformed in the digital era by new technologies and bigger, more diverse, and more dynamic data. This lesson includes a look at the entire visual data storytelling process, its evolution, and how it is bridging the gap between business and IT and revolutionizing how we communicate about data. There are numerous examples of the power of visual data stories through the ages. This lesson analyzes the storytelling power of quintessential and real-life examples from the visual storytelling canon to display the powerful capability of data stories to communicate discoveries and insights hidden in data. We ground these lessons by taking time to understand what makes data visualization and stories so impactful on the human brain. From here, we prepare to get hands on with data and Tableau to begin building visual data narratives. Putting concepts into action is paramount when practicing visual data storytelling. For many, this includes learning new software. In this lesson, we shift our focus as we begin exploring the Tableau ecosystem and review what you need to know about bringing data into Tableau to prepare for the analytic and visual process. The goal of this lesson is to help you get your footing with the basic Tableau interface and functionality so that you are familiar enough with the tool to begin working hands-on with data. We cover how to get started with Tableau, review the tool’s basic functionality, discuss how to connect to data, and provide an overview of data types in Tableau. From here, we will be able to move on to the visual analysis process, curating visuals, and building stories. This lessons ground the importance of understanding data’s context and its role in helping data storytellers ask the right questions to build a story framework. You learn the difference between exploratory and explanatory analysis and strategies for successful storytelling, including narrative flow, considerations for spoken versus written narratives that support visuals, and structures that can support our stories for maximum impact. We also explore helpful techniques in Tableau that guide us to crafting effective data narrative structure. This lesson gets hands on as we introduce the common types of visuals used to communicate data in a business setting. You learn appropriate use cases for each as we highlight their use through hands-on examples built from the catalog of charts available in Tableau. You also learn techniques to help you assess when to use these graphs, when to avoid certain types of charts, and how to generate them according to best practices, along with some of the special features in Tableau designed to help you get the most from your visualization. Visual data storytelling is a blend of art and science. This lesson dives into human cognition and visual perception to frame the contribution of pre-attentive attributes such as size, color, and position and how important they are to the storytelling process. You learn how these attributes can be used strategically to help direct the audience’s attention and create a visual hierarchy of components to communicate effectively. This lesson provides the framework for curating story arcs and layouts with visualizations in Tableau that the following lessons explore in-depth. It’s time to start building a visual data story. In this lesson you begin at the very beginning of the data storytelling process with the processing steps necessary to ready messy data for visual analysis and storytelling in Tableau. You leverage the lessons learned thus far as you work through preparing data for analysis, connecting to data, and beginning to visually explore it in Tableau. As an example of common business data, we facilitate this lesson by exporting raw survey data in order to discuss some important data preparation steps that matter in Tableau. You manually prepare the data in Excel and use Tableau 10 to get data just where it needs to be to begin building a compelling visual data story. This lesson picks up where the previous lesson left off as we look deeper into the process of constructing a data narrative by visually exploring data, and then building purposeful visualization and organizing the data to tell a story. We look closer at building a sequence of data visualizations, review how to build dashboards and organize them, as well as individual visualization in story points, and learn how to make use of some of Tableau’s storytelling features. This lesson goes beyond basic data visualization options to take a closer look at how to create several advanced storytelling charts steps-by-step in Tableau. You learn how to create advanced charts that require additional formatting and calculations, including timelines, Likert scale charts, lollipop charts, and more. These advanced charts include more calculated fields and formatting to build; however, they provide deeper, more dynamic views into data and can be beneficial in supporting more complex visual data stories.